Many owners of pocket-sized carry pistols like the Ruger LCP and Sig P238 find the cost of .380 ACP ammo to be a rude surprise. Wolf's affordable .380 load takes some of the sting away by providing an inexpensive range alternative. These rounds, packaged in boxes of 50, use a 94 grain bimetal jacketed bullet and non-reloadable steel cases with polymer coatings that enhance feeding and ejection. The steel components of this Russian-made ammunition provide substantial cost savings, but also give the round certain magnetic properties. Not all ranges allow magnetic ammunition, so check before ordering! Slightly less powerful than the .38 Special and the 9mm Luger, the .380 ACP is a compact pistol cartridge designed by John Moses Browning. Used for many years in Europe as a self-defense and police cartridge, it owes most of its popularity in the US to the concealed carry movement, which has significantly boosted sales of the compact, discrete pistols chambered for it. 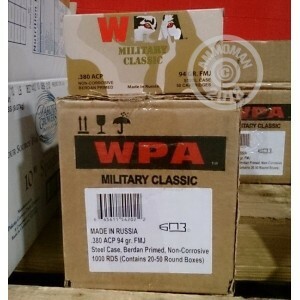 All orders over $99 at AmmoMan.com ship for free, so buy a few boxes or check out our excellent selection of case-priced ammo to reap bulk savings!